Toledo has an impressive collection of public art, with large-scale sculptures, murals, and functional structures by noted artists from across the country. Toledo, Ohio has an impressive collection of public art, with large-scale sculptures, murals, and functional structures by noted artists from across the country. Many of these pieces were acquired through the pioneering 1977 ordinance that set aside one percent of Toledo's Capital Improvement Budget for the purchase, conservation, and public education of art. Founded in 1959 as the City Culture Commission, The Arts Commission compiled the city’s first comprehensive local arts calendar beginning in 1960. By the end of the decade, the organization was brought under the City’s Division of Parks, Recreation, and Forestry to aid in public art investments at Crosby Gardens (now Toledo Botanical Gardens). In 1977 significant legislation passed that cemented The Arts Commission’s role in the community with the founding of the City of Toledo’s 1% for Art program. Overseen by The Arts Commission’s Art in Public Places Committee, the program allocates a portion of City funds for public art. Toledo’s One Percent for Art program was the first in Ohio, among the first in the nation, and has since served as the adopted model for other regional agencies. It continues to this day and features an impressive collection of public art with work from more than 40 local, national, and international artists installed in nearly every neighborhood in the city. The City of Toledo, The Arts Commission of Greater Toledo and Mercy Health have partnered to commission public art for newly constructed roundabouts as part of the Cherry Legacy Project at the intersections of Berdan Ave., Detroit Ave., Cherry St. and Manhattan Blvd in Toledo OH. On October 30, 2018, The Arts Commission’s, Art in Public Places Program, launched a nationwide request for qualifications. Over 60 submissions were received. Three finalists / teams for the project have been selected: Haddad | Drugan of Seattle, Koryn Rolstad of Seattle and RDG Planning and Design of Des Moines IA. Each artist / team has a unique style and represents a wide range of materials and approaches to developing public art. Each artist / team will present a proposal for the site on March 13 at 5:30p. The public is welcome to meet the artists and view proposal presentations. Each artist / team will have 20 minutes to present their proposal. An opportunity for comments and questions will take place after the presentations. Toledo Rise is a gateway into Toledo that captures the sense of motion inherent to the roadway site, its previous history as railroad hub, and Toledo’s spirit of innovation. Completed in October of 2018, this large sculpture and surrounding landscape was commissioned as part of the Anthony Wayne Trail / Erie / Lafayette road reconfiguration construction project. The art is a cohesive system of landforms, walls, plantings, and sculpture, the layout of which is derived from the radiating, spiraling layout of cut glass patterns and bicycle spokes. Twelve “spokes” made from train rails and textured concrete walls act as an organizing device for the landscape. The spokes transition from the horizontal plane into twelve angled steel columns forming the base of a sculptural focal point that serves as a city greeter. Perched on top of 12 angled columns is a matrix of stainless steel tubes that form a conical shape. Inspired by the image of glassblowing wands, cast glass objects made by local artist Jack Schmidt are fastened to the ends of the tubes. 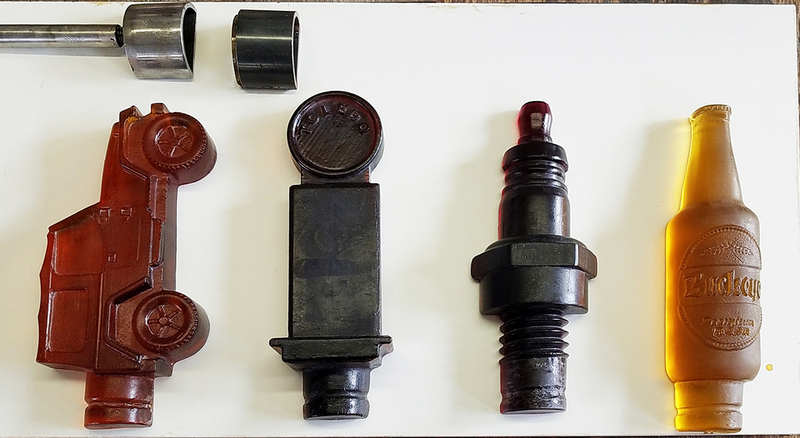 These pieces depict items significant to Toledo’s manufacturing history – bottles, spark plugs, jeeps, and scales – and their yellow, orange and red colors reference “amberina” glass coloration. At night amber and red LEDs illuminate the matrix, producing a flame-like presence. The Arts Commission worked with the Ohio Department of Transportation and lighting contractors, HLB, to commission lighting sequences from local artists to be added to the schedule of the newly upgraded lighting system on the Veteran’s Glass City Skyway. All of the selected artists are local to Toledo and include Brien Strancar, Natalie Lanese, Gail Christofferon, Imani Lateef, Yusuf Lateef and Anthony McCarty. Twelve total designs were developed for the bridge. The designs rotate nightly with special shows for patriotic holidays, highway safety week and other days of significance. Through an effort to further distribute Toledo’s public works of art more evenly by district, Close Park in District 5 was identified as a site for a new public art project for 2019. Nestled in a densely populated West Toledo neighborhood and across the street from Blessed Sacrament School, this site has been identified as a perfect location for a new public art project. A request for qualifications was sent out on January 4, 2018, which resulted in responses from over 60 artists from all over the United States. Through an extensive review process, including community meetings with neighborhood stakeholders, the Design Review Board has selected Minneapolis artist, Randy Walker’s, proposal entitled “Close, Closer, Closest.” The installation includes approximately 400 colorfully painted steel poles representing each house in the immediate neighborhood. The poles will stand in a small garden shaped to mimic Close Park’s shape. The poles will vary in height and color determined by members of the community. Like the park, the Close, Closer Closest will be an interactive life-filled space that changes as it is experienced from different vantage points and as one moves through and around it from season to season. Installation of the work is planned for spring of 2019. Eight totem-like carved wood poles of differing heights to 27 feet welcome visitors to Toledo Botanical Garden, Metropark. A part of a series of cast concrete arches based on Buckminster Fuller's theory for the concrete suspension bridge. Fuller theorized that if concrete elements were stung together on steel cables and torque was applied, the result would be a rigid form with great strength. Installed at Toledo Botanical Gardens in 2017 in honor of Richard Boers. A glowing 27-foot spiraled column of powder-coated stainless steel and glass represents the piano keys of the legendary jazz pianist, Art Tatum. A cast bronze obelisk in the center of Children’s Park at Dr. Martin Luther King, Jr. Plaza is engraved with a quote by Garrison Keillor, “Nothing you do for children is ever wasted”, and covered with childhood objects. The brightly painted 25,000-pound aluminum two-story landmark rises from below street level of the Vistula Parking Garage on Summit Street. Once a towering portion of metal smokestack sitting atop the steam plant, ECHO’s eleven rings now integrate into the landscape creating a pathway that serves as a metaphor for Toledo's transition from past to present to future. A bronze and granite centerpiece in the shape of an ever burning lamp of learning resides in the Lucas County Main Library's public park on Michigan and Adams Streets. A wall of memories at One Seagate by Hebrew Academy students were cast into bronze plaques and mounted on a retaining wall along the river. A miniature painted steel and brick sculpture of fire fighters and a burning building mark the entrance to Birmingham, at Front and Consaul Streets on the East Side of Toledo. Three cloud fountains on pillars of stainless steel are viewed in the round near Walbridge Park. Five large sculptures located on Collingwood Avenue medians between Ashland and Central Avenues. Three bronze life size figures competing for a classic moment in baseball are installed on a turn-table to face Monroe Street or Fifth Third Field. A colorful, aluminum sculpture in Levis Square swoops and spins like a traditional Japanese performer. Hundreds of bronze squares of children’s reactions to life are set into a walkway in Promenade Park. A dramatic, vivid orange, corten steel abstract sculpture in Civic Center Mall angles sharply upward. 22 manhole covers of cast metal honor Toledo Mud Hen baseball. Positive and negative images of a tree within a sandstone block circle are cut from a 20-foot slab of steel, recycled from lake freighters, truck trailers, and a nuclear power plant. Kleis Park in Point Place includes inlaid brass images in concrete of creatures found in the Ottawa and Maumee Rivers. It was created in collaboration with Lajos Heder. A stone gathering place outside the West Toledo Library invites reflection of the title from the ancient Roman poet, Juvenal. Inspired by a Victorian conservatory and suggesting a Native American thunderbird, the aluminum and brick gazebo creates an entrance to the City of Toledo’s Ottawa Park. Frederick Law Olmsted designed the greenspace of this city park. 50 feet of openwork steel combining movement and tension was donated by the Junior League of Toledo. Two 14 foot corten and stainless steel kinetic sculptures replicate a pitcher and batter at the University of Toledo’s Scott Park ball diamonds. A bronze and steel likeness of Dr. Martin Luther King, Jr. is centrally located on the bridge named in his honor. A painted mural extendis from outside to inside of the Gonzalez Family Center on South Avenue. The centerpiece of a fountain at the entrance to one Government Center is a tall chalice-shaped bronze structure. A large, steel abstract sculpture was donated to the City of Toledo in memory of the powerful labor leader, Richard T. Gosser as a gateway to the Uptown district. A welded steel image of a young girl lifting her arms to the sky, stands within her own “forest”. A cast bronze memorial to Sylvanus Pierre Jermain standing on a sundial honors a community leader and golfer for the creation of many of Toledo’s public greenspaces. Life-size bronze sculpture of a man and child symbolize the good works inside the Community Services Building. The “To Protect and to Serve” police motto is incorporated into the steel gates supported by a limestone gateway at the WPA-era Scott Park police station. A glass and steel oversize locomotive headlight on lengths of actual track marks the entrance to Toledo’s Amtrak station. A memorial to John Noble Richards, a local architect, was originally wood but later restored in metal to endure the environment changes. The sand-blasted concrete black and white frieze created for the Toledo American Bicentennial Commission enhances the entrance to the Frederick Douglass center. A 60-foot tower of stainless steel, glass and reflective tape diffracts sunlight into a beacon of rainbows. Intricate brick angled steps are located at the mouth of Swan Creek in Boeschenstein Park at the Middlegrounds. Five life size bronze figures on an adventure at Promenade Park won the 1988 Henry Hering Memorial Medal of the National Sculpture Society. Flame shaped openings in the 12-foot steel monument is a tribute to the hard-working families of East Toledo. Toledo policeman, Oscar O. Bruhl, modeled for the Toledo Patrolmen’s Association bronze commission. The 17-foot ceramic mural of carved, glazed tiles depicts the Toledo sister cities side by side. Tower of Light transforms the stairwell tower of the Promenade Park Depot parking garage into a beacon of light. Each windowpane becomes a tile of a large, three-dimensional light mosaic enveloping the stairwell tower. The colors of the tiles change slowly in soothing light animations. This sculpture honors all who built the Veterans’ Glass City Skyway, but specifically the five workers who lost their lives during construction. The kinetic features represent the tireless spirit of these workers. Located at Tribute Memorial Park on the East side. On the former site of the Electric Auto-Lite Plant, larger-than-life bronze and brick picketers are reminders of the 1929 strike that initiated the development of the American labor union movement. A 12-foot limestone curved stone lintel atop twin pillars is a metaphorical gateway to a peaceful world. Outside of Toledo’s Municipal Courthouse, a 12-foot tower of brushed stainless steel was a gift of the Toledo Bar Association. 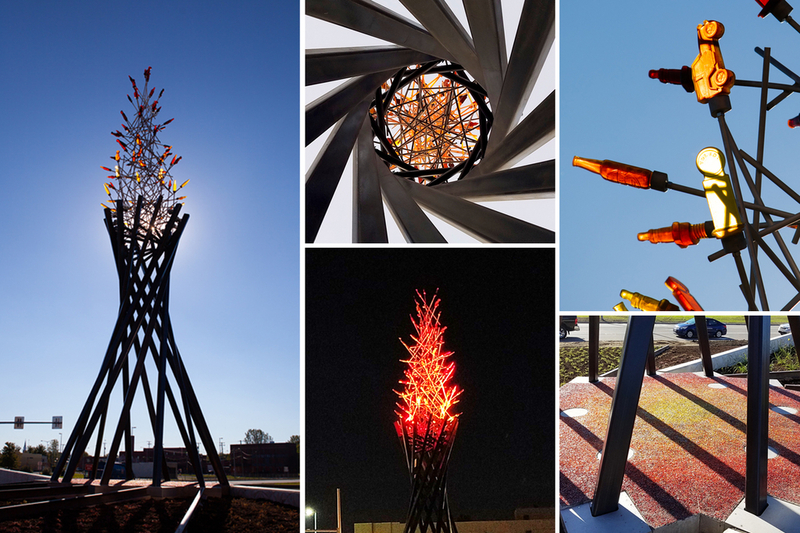 A 22-foot arch of bronze, copper, aluminum, glass and fiber optics represents indigenous plants and wildlife as a pathway into Walbridge Park on South Broadway. Aluminum floating boat-like sculptures follow the wind across Crosby Lake. A bronze gang of four life-sized kids peek at home plate through a knothole in the east wall of Fifth Third Field. A bronze matron in hat and long coat stands in the Herb Garden, for which the sculpture was designed. The City of Toledo has charged The Arts Commission with the oversight of its 1% for Art collection. The Arts Commission through its Art in Public Places (APP) Program maintains and conserves this group of more than 80 original public art works. The APP program utilizes highly skilled maintenance technicians and qualified fine art conservators to complete projects that range from routine washing and waxing to major conservation overhauls. The Arts Commission is proud to serve the City of Toledo in this way and works diligently to ensure the collection remains in the best possible condition. The ABC’s of Public Art is an alphabet book that features the City of Toledo’s rich public art collection. This beautifully produced publication has been created as a service of the educational component of the City of Toledo’s One Percent for Art Program and is available for free to interested parents, teachers and/or mentors of young children. Anyone who is interested in receiving a copy should contact The Arts Commission for more information. The publication has been distributed through a number of literacy and outreach programs including Reach out and Read, Read for Literacy, Toledo Museum of Art Family Center and Early Intervention MRDD. Inspiring vibrant spaces - together. The Arts Commission is proud to partner with the City of Toledo to inspire a vibrant sense of place and community. Since 1977, The Arts Commission has managed the One Percent for Art public art program on behalf of the City of Toledo. The program is the first public art program of its kind in Ohio and served as the model for the state's own program. Ordinances and standard operating procedures in relation to public art in Toledo. The following language is that which appears in the Toledo Municipal Code defining the process for which public murals are to be approved by the City of Toledo. This process was put in place not to hinder the growth of public art in the community, but to protect the artwork and to help ensure the investment of artists and businesses owners who wish to create public mural projects so that they may be preserved and enjoyed for years to come. Murals are an integral part of the cultural expression in the City of Toledo. Murals will be created by artists of diverse cultural traditions and backgrounds. The intent is to aid artists and others in understanding issues surrounding the creation of a mural and to apprise parties involved in mural projects of the permit process. All conservation and restoration will be the responsibility of the property owner. All murals which are on public property or visible from a public thoroughfare within the City of Toledo must receive prior permit approval from the Arts Commission of Greater Toledo. Artists or community groups who want to paint murals must obtain permission from the property owner. Murals on public or private property without permission of the property owner will be illegal and punishable by law. The conservation and the maintenance of the murals will be the responsibility of the property owner. This ordinance will not permit any type of illegal sign, irrespective of artistic content. The Arts Commission of Greater Toledo will be responsible for administering the Murals Program.